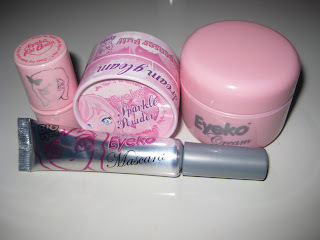 EYEKO BEAUTY MAKEUP HAUL! I have been anticipating my Eyeko package so much,and it finally arrived! I was like a kid at Christmas! 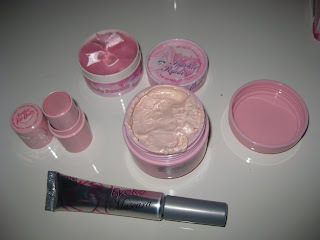 These delightful products are amazing,pretty in pink! The thing I was most looking foward to getting was the Eyeko Mascara.I've read so many good reviews,and I was excited to try it. and as FREE GIFTS I got: Eyeko Minty Fat Balm & 3 packs of Eyeko Face Off cleansing wipes! I used AMBASSADOR CODE E1787 for FREE SHIPPING WORLDWIDE & FREE GIFTS! The mascara is what I expected: Amazing! Doll like lashes-false lash effect,in 1-2 swipes!! I've been using M.A.C Zoom Lash & sometimes Lancome Hypnose..now I've found my HG Mascara for only $8..not to mention how cute the silver tube with the Anime girl! The sparkle powder is nice-the shimmer is built in the puff,and has a nice candy scent! Its not like chunky glitter,its very fine & gives skin a gorgeous gleam. The 3 in 1 cream is awesome,I use it as an undereye highlighter,and on the cheekbones..has a beautiful pinkish gold glow which is subtle,but very beautiful. 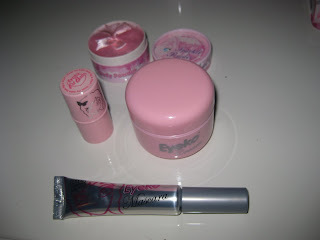 The minty Fat balm is also nice..has a pink iridescence,with a mint smell as the name implies. I haven't tried the makeup wipes yet but that will be my next feat! 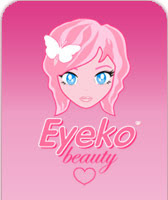 Im definitely placing another Eyeko Order soon,I want like 100 tubes of that fab mascara!! With FREE WORLDWIDE SHIPPING & FREE GIFTS using AMBASSADOR CODE E1787, What are you waiting for? Order now..you won't regret it!! is that your ambassador code? Send this to all your friends and family!